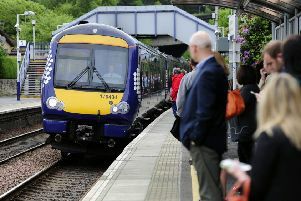 Almost every train route across the Central Belt has been suspended due to Storm Ali as high winds and heavy rain batters Scotland. 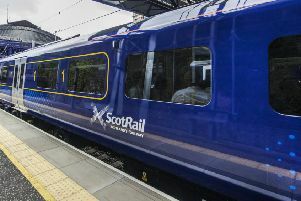 Earlier we reported on damage to the overhead wires at Patrick and a loss of electricity on the line between Glasgow Central and Lanark, now Scotrail is reporting several lines are blocked by fallen trees. It is advising people only to travel if absolutely necessary. A statement said: “The Met Office has issued an amber weather warning for high winds and heavy rain. Storm Ali is having a severe impact on Scotlands railway infrastructure, particularly in the Central Belt. “The storm has caused major line blockages for example a number of trees have fallen onto the line - and overheard wires have been damaged. This has resulted in the suspension of a number of our routes. “Network Rail engineers are working flat out to get things back to normal, and ScotRail is doing everything it can to keep people moving. But services will be severely impacted for the rest of the day. “Ticket acceptance is in place with bus operators across many parts of the country, and we are working to get buses in place to replace trains on some routes. They disruption is expected to last until at least 8pm, by which time the storm should have calmed down.